Sometimes we are unable to view an eBook on certain device because its’ format is not compatible with the device we are using. EPUB, for example, is a popular format widely used on software readers such as Apple iBooks on iOS & macOS and Google Play Books on Android, but not by Amazon Kindle e-readers. To read our EPUB eBooks on Kindle, we’ll have to convert the EPUB format to Kindle-supported one – MOBI, which is the best choice. 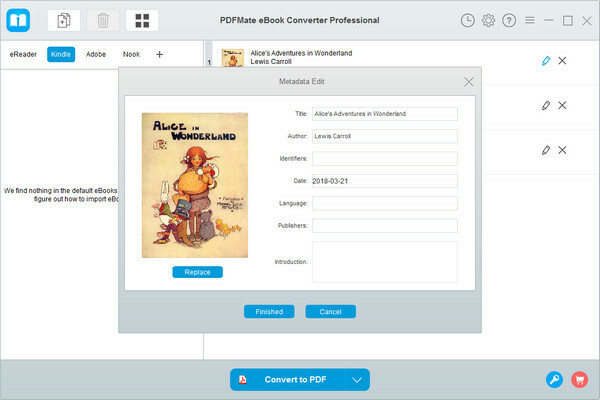 PDFMate eBook Converter, one of the most popular EPUB converters in 2018, is specially developed for converting EPUB to MOBI, AZW3, PDF, TXT and KFXformat. Besides, it is able to remove the DRM from Kindle, Adobe, Kobo & Nook eBooks so that we can read eBooks on more devices with better reading experience. 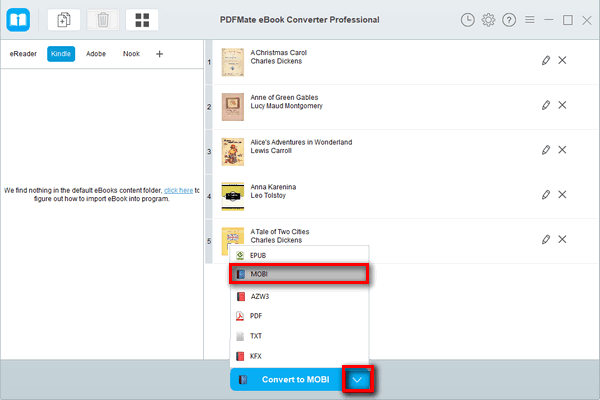 PDFMate eBook Converter preserves all the important metadata of our eBooks after conversion, including Title, Author, Publisher, etc. And we can even edit the metadata for our own convenience. Now let’s take a look at the software and learn how to apply the program to convert EPUB to other popular formats. - Retain metadata after conversion. Click "Add" button on the upper left and then we will be able to browse and select the eBooks from our local computer to upload them to the EPUB Converter. And if we connect our eReader to the computer, the program will automatically detect it and display all our ebook files. After successfully adding the our eBooks to the program, by clicking the "Pen" icon on the right, we can edit all the important meta information before conversion, including title, author, publishing date, publisher and so on. If we want to customize the output path for the converted files, just click "Settings" button on the upper right. 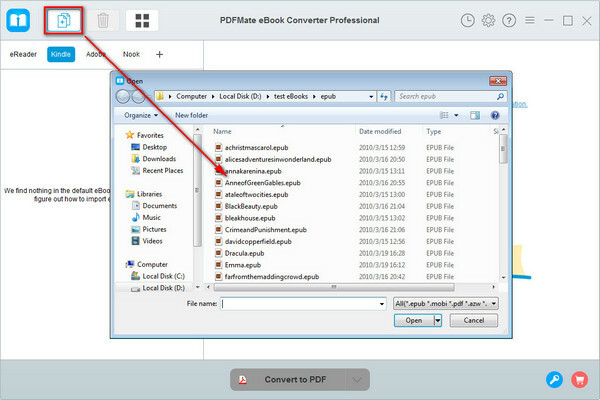 Otherwise, the output files will be saved under C:\Users\User Name\Documents\PDFMate eBook Converter Professional. Click the “V” button on the bottom and then we will be able to choose to convert our eBooks to PDF, MOBI, AZW3, TXT or KFX format. Just click on the format that you want your EPUB files to be converted to and then press "Convert" button to start conversion. Good after-sale service is an essential part of an excellent program. 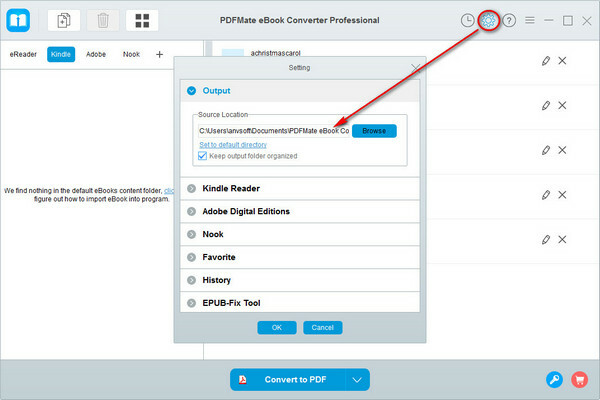 PDFMate eBook Converter promises life-long free updates and technical support. Should we encounter any problem when using the program, we can contact PDFMate support team at support [at] pdfmate.com (replace [at] with @ before sending e-mail) for help. 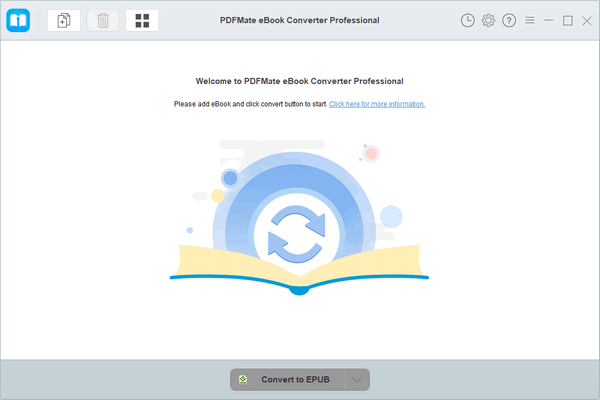 PDFMate eBook Converter is an ideal EPUB converter if you are looking for a software to convert your EPUB files to other formats. The only reason that we may hesitate is that it’s a shareware instead of a free program. We advise you download the trial version first and then decide whether you want to apply the program with one time purchase at $29.95 but life-long free updates and technical support.